François Rautenbach of Singita with paddle. 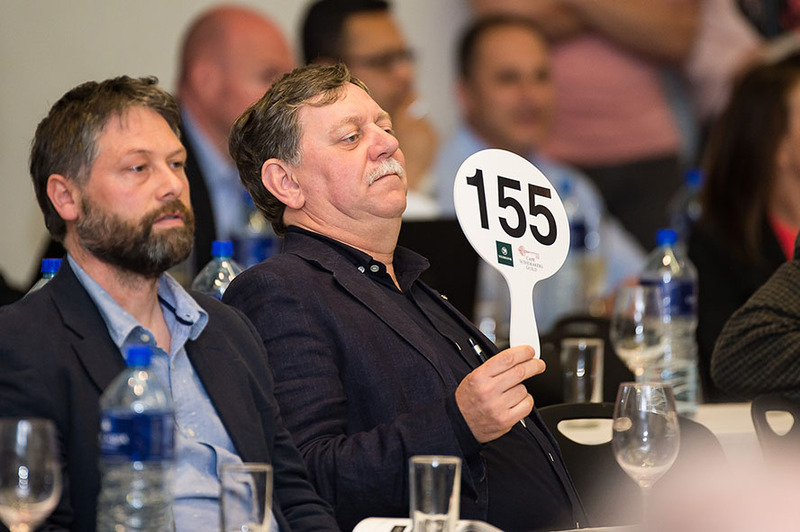 Total sales amounted to R10 593 760 at the 34th Nedbank Cape Winemakers Guild Auction held yesterday, 2 012 cases (6 x 750ml equivalent) sold at an average price R5 265 case and an average price per bottle of R878. This compares to last year’s sales of R13 223 200 for 2 962 cases, average price per case being R4 464 (average price per bottle: R744). The Kanonkop CWG Paul Sauer 2015, the first item of the day, achieved a maximum price per six-bottle case of R22 500, this being a record amount paid at the auction. The 50 cases on auction fetched a total of R1 029 000, the equivalent of R20 580 per case or R3 430 a bottle. Top achieving red wines (based on an average price per case) behind the Paul Sauer were Boekenhoutskloof Syrah Auction Reserve 2016 (R10 664), Rijk’s CWG Pinotage 2015 (R9 670) and Etienne le Riche Cabernet Sauvignon Auction Reserve 2015 (R9 295). Top achieving white wines were Mullineux ‘The Gris’ Semillon Old Vines 2017 (R5 657), Ataraxia Under the Gavel Chardonnay 2017 (R5 070), Paul Cluver The Wagon Trail Chardonnay 2017 (R4 910) and Jordan CWG Chardonnay 2017 (R4 771). The average price per case for Méthode Cap Classique was R4 419 for Silverthorn Wines Big Dog IV 2013 and R4 253 for Graham Beck Cuvée 105 “MGA” Zero Dosage 2009 Pinot Noir Chardonnay. The only port-style wine, Boplaas Cape Vintage Auction Reserve 2015, sold for an average price of R3 933. The auction attracted a total of 123 buyers comprising 102 local and 21 foreign buyers – 79% or purchases were made by local buyers and 21% by foreign. The hospitality industry was once again well represented amongst the top buyers with Singita, Tsogo Sun and Marble Restaurant snapping up just over R2 million worth of auction wines. The line-up of 48 wines included 31 red wines, 14 white wines, two Méthode Cap Classique wines and a port-style wine.